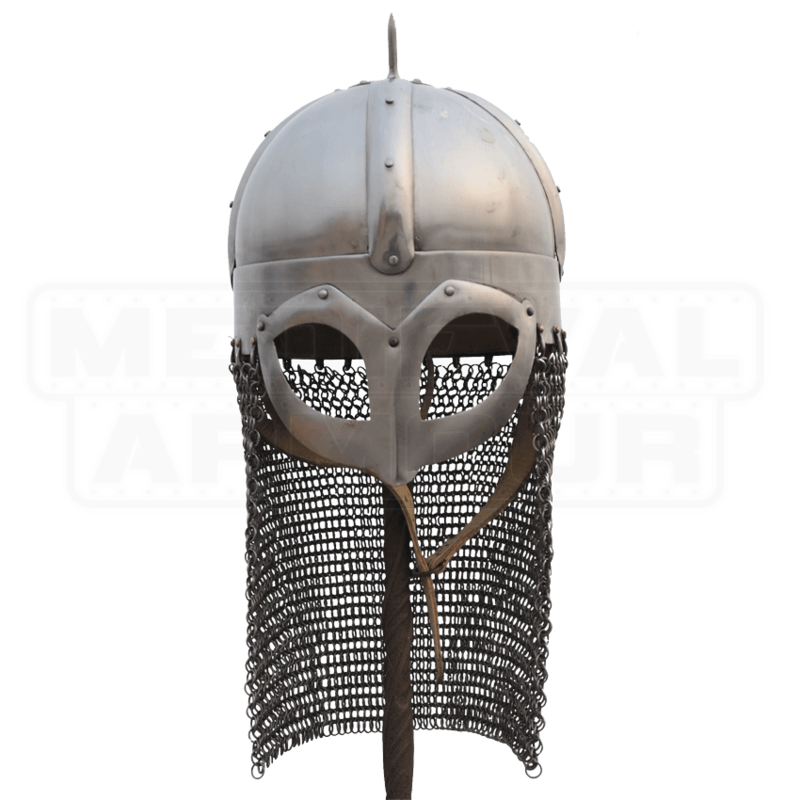 If you are looking for an authentic Viking helmet to wear for your reenactment, then you may wish to consider wearing this Gjermundbu Helmet with Aventail. Not only is it highly protective, but it is also a historically accurate Viking helmet. This steel helmet derives its name from where it was first unearthed at Gjermundbu, Norway. Helmets of this style are often considered to be one of the true styles of authentic Viking helmets, and in the case of this particular example, are a true Viking helmet that provides a high degree of protection to the wearer. The helmet consists of a simple skull cap that features riveted bands as both decoration and as reinforcement, as well as a single spike that is mounted at the apex of the helmet. The front of the helmet features a protective eye piece, offering subtle protection to the face, while the sides and back feature an attached aventail, which protects more of the neck with a mail drape. The helmet is crafted from 14 gauge steel, which makes it a tough and sturdy item that will take virtually any punishment that is thrown its way, while also featuring an internal leather liner as well as a chin strap that is perfect for keeping the helmet secured onto a warriors head. The helm comes in two sizes, either medium or large. 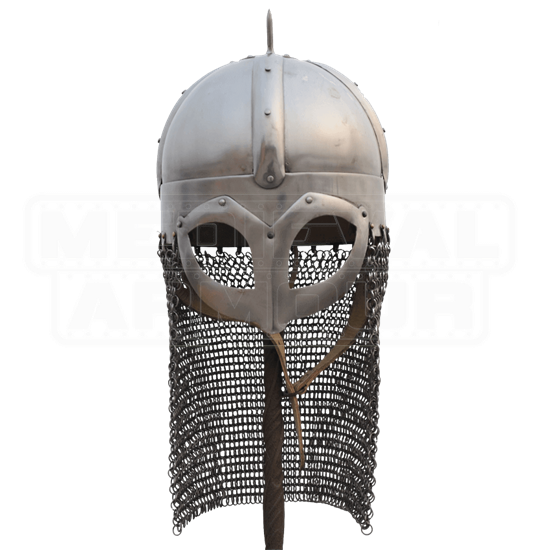 For a truly authentic look that is worthy of a real Viking warrior, you should turn to this Gjermundbu Helmet with Aventail. Not only does it feature authentic Viking style, but it also protects quite well, making it a reenactors dream.